I was afraid when I saw them arriving in the mail and how small they were that they wouldn't make it, I quickly judged and boy am I wrong. They are thriving and looking great! Will never early judge again. (about 4 to 5 inches tall)and aromatic. Boston Ferns consist of long, slender fronds similar to the Sword Fern. They do, however, grow considerably smaller in size than their close cousins. Many growers and gardeners confuse Boston Ferns with the Sword Ferns, and in many areas, domestic Sword Ferns have become an invasive species. They are entirely non-toxic and are even safe for cats to eat, something that contributes to their popular use as a potted fern in indoor gardens. Because they are small, they also work well for lining flower beds and garden paths. 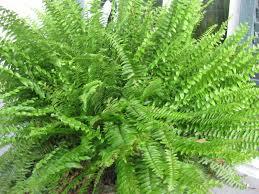 These ferns are very popular when it comes to landscaping and decorating large porches or patios. They grow very well when added to large containers and hanging baskets that supply the sufficient drainage for them. These are wonderful as they grow to become full and adds lots of gorgeous green color as they grow to maturity. BostonFern grows to become very thick and dense and are also very easy to grow for all gardeners and homeowners. Boston Fern will grow well in well-drained soils.